The first thing we discovered about northern California’s Redwood Country is that it isn’t all about giant redwood trees. Yes, the ancient redwood forests of northern California are incredible and standing next to a living thing that’s 2,000 years old, taller than a thirty-five story building and over forty feet in circumference stretches the mind’s ability to comprehend. But there’s more than even that in Redwood Country – much more. Within Redwood Country are remote, windswept Pacific beaches, Victorian towns with excellent wineries and breweries, mountain wilderness and rivers flowing through the forests to the ocean that are warm enough for swimming yet wild enough for bears and salmon. This is a very special place. Set amidst California’s Coastal Range of mountains, redwood trees grow to over 360 feet tall, the tallest living thing in the world. But the coast mountains reach their peak at the King Range where the steep mountains drop directly into the Pacific Ocean. This is the Lost Coast, named this because it is so rugged no highway can penetrate it and the coast too rough to approach by sea. Inland the Trinity Alps reach to snowy crags of tundra and wind-scoured rock. In between are magnificent rivers; The Klamath, The Humboldt, The Eel, The Trinity, all flowing through forested canyons to the wild Pacific. A quick word about the redwoods. The giant redwoods of northern California once grew in an unbroken old-growth forest from San Francisco into the Oregon border. You know when you are in an old-growth forest. They’re park-like places where the ground is covered in low ferns and clover-like oxalis; the unbelievably huge trees shading the ground below and keeping it from growing into a brushy tangle. Over two million acres of this old-growth forest thrived in the foggy western slopes of the Coast Range; a line of low mountains following the Pacific coast. Unfortunately, the wood is valuable and they were heavily logged from the 1800s well into the twentieth century until a few visionary people, including some lumbermen, realized they were almost gone and efforts were made to preserve what was left. Today barely one percent of this ancient forest remains in northern California’s Humboldt, Trinity and Mendocino counties. But, even the remining one-percent is amazing and it’s no wonder people come from around the world to see them. OK, back to our story. We had become relaxed about planning our travels after drifting south along Oregon’s quiet, peaceful coast. There we just drifted into a park and easily found beautiful spots to camp. But now the summer travel season had started and as we searched the internet for places to stay in California we got worried – state and county parks were all booked up and we didn’t want to roam around while towing a fifth wheel trailer looking for a spot to stay. So, we reserved a spot in Redwood Meadows, a private RV Park outside of Crescent City, and the most expensive place we’d camped since starting our travels in April. At $45/night for a crowded spot with electrical service and water but no sewer connection, it was a disappointment. The park’s saving grace was good WiFi connections and its proximity to the magnificent groves of ancient redwoods at Jedidiah Smith State Park. So, we spent the next few days away from the crowded park exploring the gigantic trees only returning to the RV park to eat and sleep. Jedidiah Smith State Park is large and contains about seven percent of the remaining old-growth redwoods left in the world. It’s an excellent place to begin exploring Redwood Country but a warning; photos and videos just can’t capture the grandeur of these forests – the trees are just too huge to fit in a photo. We’ve done what we can to show them, but you have to see them for yourself to believe them. We spent our first day walking through the Stout Grove, a section of particularly large redwoods along an easy one-mile long trail. Our necks were soon sore from staring up at trees over three hundred feet tall. A dirt road, Howland Hill Road, winds from Crescent City through Jedediah Smith Park with more trails and more giants. We never ceased to be amazed at each new spectacular grove of trees we walked through. Hell, even the drive through them on Howland Hill Road was spectacular. The Stout Grove whetted our appetite for more ancient forests, so the next day we drove south to tiny Orick where a Redwoods National Park office is located. Here we picked up a permit to enter a special area; the Tall Trees Grove. Entering this area is by permit only due to the long, winding road leading into the area (no trailers or RVs allowed). After driving in to a trailhead it’s a four-mile round trip hike from there down a mountainside and into the grove at the bottom. It’s well worth the effort. The permit and the moderately strenuous hike keeps the crowds away and the trees are huge even for giant redwoods. Set along tranquil Redwood Creek the Tall Trees were tall alright, one of them 364 feet tall, and we had a great sunny day wandering through the mossy old trees; a truly awesome place. We found something else on the way to the Tall Trees; Fern Canyon. Located at the end of a rough, steep dirt road in remote Gold Beach State Park is a vertical-walled canyon entirely covered in ferns; sword ferns, licorice ferns, maiden hair ferns, deer ferns. It’s surreal – so surreal it was used as a scene in the movie Jurassic Park. It was like being in a deep, hallway of green with a clear, cool brook running through it. What an amazing place! After that we wanted more; more ancient forests, more amazing places. And, we found them. We moved from Crescent City south to Eureka alongside Humboldt Bay. Still concerned about finding a place to park the trailer we reserved a spot at another private RV park, Redwood Coast, a sister park to the park we’d stayed in at Crescent City. The park manager at the Crescent City park managed both parks and offered us a weekly discount at the Eureka park. But even with a discount the Redwood Coast park at Eureka was $41 per night and it was even more crowded, set behind a trashy lumber mill, and again offered only electrical service and water. That was enough! After this we would stay in state or county parks, national forest or Bureau of Land Management campgrounds, or go “boondocking” (camping far out on public lands for free). Still, the Redwood Coast RV park made a good base for exploring the area. Exploring northern California wasn’t all about just redwoods for us. We spent one day shopping for supplies in Eureka and another walking around funky, hip Arcata with its Victorian houses and home to Humboldt State University. We even went to the movies at the tiny Minor Theatre in Arcata (Pirates of the Caribbean). And, hiked through more redwoods of course. From Eureka we drove south Fortuna and walked through the Chatham Grove of redwoods where another movie was filmed, the scooter chase scene in Star Wars. But, we had another reason to drive to Fortuna; we were on a scouting mission. Fed up with expensive, crowded private RV parks we scouted out a county park and a state park off the beaten track; Grizzly Redwoods State Park and Van Duzen Humboldt County Park along highway 36 outside of Fortuna California. They both were quiet places along the gentle Van Duzen River with generous camp sites under old-growth redwood trees. But, as with most county and state parks, they can’t be reserved and staying there is on a first come, first served basis. So, we decided to trust our luck and wing it as we filled our fresh water tanks and drinking water jugs, emptied our waste tanks at a nearby dump station, filled the truck with diesel fuel, and prepared for any type of camping situation we might find. We hitched up our fifth wheel trailer and happily left Eureka and Redwood Coast RV Park. By avoiding the weekend, getting away from busy highway 101, and showing up in early afternoon on a week day we figured that we would have a good chance at finding a good campsite. We were right and our plan paid off far beyond our hopes. We drove up narrow and windy highway 36 to Van Duzen, Humboldt County Park, on a Tuesday afternoon and found the small park less than half full. Now our decision to buy a trailer less than thirty-feet long came into play since the roads through the small park were narrow and windy and all of the campsites were too small to accommodate a RV any larger than ours. Even then I had to do some maneuvering to back our twenty-seven foot-long fifth wheel into site #14. It was well worth the effort. The small park is set in a grove of old-growth redwoods just twelve miles from Fortuna on highway 36. For $32/night (with $3 senior discount) we had water and a 30-amp electrical hookup (no sewer service and no cellular signal). But, the site was secluded with no neighbors nearby. Better yet, the Van Duzen River flows through the park and forms into spectacular swimming holes with some sandy beaches with water warm enough for swimming. We immediately paid for two nights but eventually stayed for six. It was just too nice a place to leave. We celebrated our find with a bike ride around the campground followed by a steak and artichoke dinner cooked on our outdoor kitchen under the shade of a massive, old-growth redwood tree. If there’s one place to come to see the best of Redwood Country it’s here; the area south of Eureka and around Fortuna. Just south of Fortuna the Avenue of the Giants starts. This is an older roadway paralleling modern highway 101 and it runs through the largest continuous forest of old-growth redwoods in the world. The Avenue of the Giants includes Humboldt Redwoods State Park which makes an excellent base from which to explore the whole area with its trails, campgrounds and large redwood forests. Just to the north is Victorian Ferndale, one of the most extensive Victorian towns in the United States set along the broad, flat delta formed by the Eel River. To the west is the Lost Coast and the King Range National Conservation Area where the mountains fall into the Pacific Ocean in the wildest and most remote coastal wilderness area in America. Westward are the Trinity Alps where the coastal range rises into snowy peaks with whitewater rivers flowing out of them through deep forested canyons. We explored them all. It was overwhelming just deciding where to start exploring this vast area, so we spent the first day relaxing in our camp, planning, and grocery shopping at nearby Fortuna. 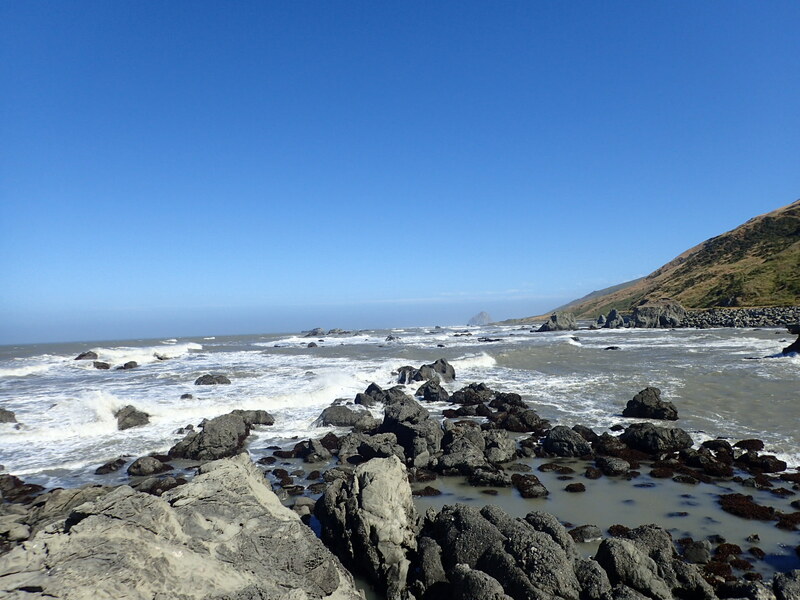 We decided to start with a big day; driving deep into the Lost Coast and return through Humboldt State Park. So, we went to bed early to rest up for the trip the next day. Up early at first light. We packed our lunch, filled the truck with diesel fuel and drove to nearby Ferndale to start the day. The first stop in Ferndale was the pie shop where we had the best rhubarb/strawberry pie I’ve ever had. We walked through the preserved Victorian town and were amazed to find that the ornate buildings weren’t confined to just the downtown area; even the surrounding neighborhoods were full of brightly painted gingerbread houses from the late 1800s. It was a peaceful, sunny place and also the beginning of the Capetown/Petrolia Road, a rough, steep, winding track into the heart of the Lost Coast and the King Range. The King Range of the Lost Coast is managed by Bureau of Land Management and a few days earlier we stopped in the BLM office in Arcata to pick up maps and information about it. We had considered dragging our fifth wheel trailer into the King Range to hike the wilderness trails there, but the BLM officers warned us that this is a major, and illegal, marijuana growing area. And, the few roads into the area were too rough for RVs, even trailers. 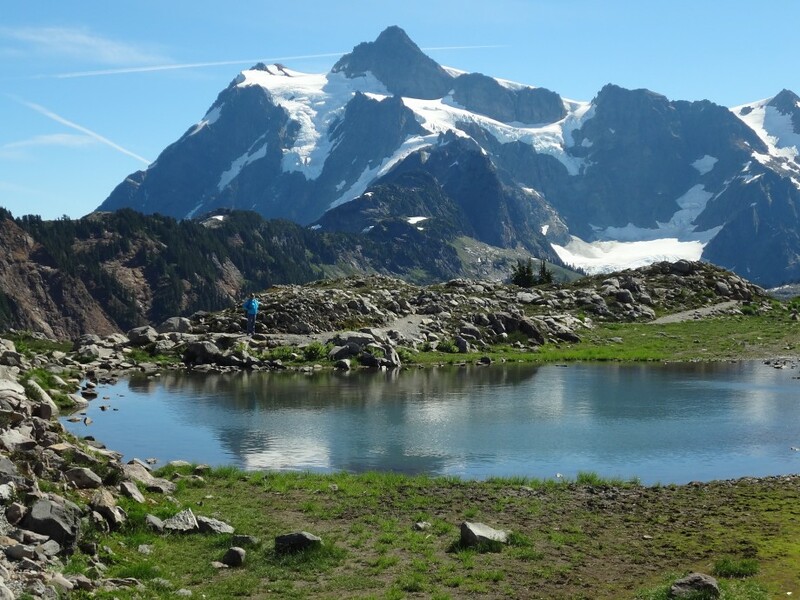 So, we decided to explore the area as day trips out of our comfortable camp in Van Duzen with just the truck. We started out of Ferndale up the Capetown/Petrolia Road and were glad we weren’t attempting to drag our fifth wheel trailer along this route. The road narrows to one-car width where it has slid out falling into deep canyons with no guard rails and winds around so many hairpin-turns that we lost count of them. We climbed higher into the mountains and into a fog so thick we couldn’t see more than ten feet in front of us. Potholes and broken pavement rattled our teeth as our heavy one-ton truck bucked and bounced down the narrow track. An occasional car passed by heading into town, otherwise the road was empty. Suddenly the fog lifted, replaced by blue skies and sun, and we were facing Cape Mendocino, the westernmost point in the conterminous United States, far below us. We drove down to the cape and walked around it. A strong, cold wind made it hard to keep our balance as we walked towards the cape and the Pacific was rolling in with fierce breakers pounding the rocky shoreline. There wasn’t a human habitation in sight. It’s an appropriately wild and dramatic lands-end to the westernmost point of the lower forty-eight states. We drove on, leaving the coast and heading inland on the small country lane where it immediately warmed up as we left the cold, windy coast. Finally, a few small farms and homesteads appeared and we entered the small hamlet of Petrolia. A few backpackers lounged around in front of the only store and the place had the atmosphere of a remote outpost. Our goal was Punta Gorda at road’s end, so we drove on. Just outside of Petrolia we turned off to Mattole Beach where there’s a small Bureau of Land Management campground with a few hardy souls staking out their tents in the sand dunes whipped by the constant wind. Next to the campground was the road to Punta Gorda. We drove up the dirt track to Punta Gorda, a high, grassy bluff overlooking the Pacific. We had to gear down into low-range four-wheel drive to reach the point, but it was well worth it. The wind howled over the treeless bluff almost blowing us over at times and with the grass covered hillsides flowing in the strong wind like waves on the ocean. The Pacific rolled in with wild breakers pounding the shoreline below us. We ground back up the dirt track and back down to Mattole Beach. Now back in two-wheel drive we followed the country road inland, stopping at peaceful A.W. Way Humboldt County Park for lunch and a nap along the peaceful Mattole River with its clear water and deep swimming holes. This would be a fantastic place to camp in the trailer if we could haul it in over the rough, winding roads. On to tiny Honeydew, the only other small village along the way. From there we followed the road up and over the mountains to Humboldt Redwoods State Park. This road, though still rough, narrow and curvy, was a much more possible route over which to haul a small trailer into the Mattole Valley. We’ll remember that for the future. By mid-afternoon we entered Humboldt Redwoods State Park and its impressive groves of ancient redwood trees. We stopped to take short hikes, one to the Giant Tree, a massive old patriarch over three-hundred feet tall. It had been a long day and now we were tired, so we headed back towards our camp at Van Duzen County Park. But we weren’t done yet. We had noticed a restaurant in an old, plank sided building in tiny Carlotta, the last village on highway 36 a few miles before entering the forest road to our camp. Restaurant 36, advertising cold beer and hot food, it looked interesting. It was getting late, and we were hungry so we stopped for cold Rogue River beers and an excellent fried chicken dinner. A perfect end to a perfect day. By the time we got back to our shady camp it was late afternoon. I rode my mountain bike up to a deep pool on the Van Duzen River and took and evening swim. I had the whole river to myself as I floated in the cool water past fifty-foot cliffs capped with redwoods and Douglas fir trees. Satisfied but exhausted we went to bed early still savoring the day. Tomorrow, the Avenue of the Giants. As the morning fog burned off we set off from our camp at Van Duzen park for the Avenue of the Giants, a thirty-one mile long drive through the largest redwood forest left in the world. It’s a winding road paralleling highway 101 through a few small towns and Humboldt Redwoods State Park. There are lots of short hikes through groves of massive trees and at risk of using an over-used word; it was enchanting. By now we were getting somewhat used to hiking through these old-growth giants, but along the Avenue of the Giants you are immersed in them, even the road is narrowed by immense redwoods standing alongside, and some of the largest trees of all are here. Amazed, we took our time, stopping for short hikes here and there. Of course, any tourist route has its kitschy tourist traps and we stopped at few. Trees of Mystery, The One Log House, and chainsaw carvings of everything from bigfoot to fairies and gnomes. We don’t visit many of these places, but one or two is fun. But it was late afternoon, so we headed back to our sanctuary at Van Duzen park for dinner in camp and watching the Milky Way shine through the tops of the giant redwoods surrounding us. Another fine day. We had been hiking, sleeping and living within the ancient redwood forests for over a week by now. We were ready to explore the wildernesses high in the coast range; places like the Marble Mountain Wilderness or the Trinity Alps. So, the next day we loaded up the truck with our lunch, water and fuel and drove a long loop starting eastward on highway 36 and returning to our camp through Eureka on highway 299 to the north. It was an all-day drive, but the goal was to hike up into the snow, rock and tundra of the high country. As we left the cool shade of the redwoods near the coast it got hot, very hot, over a hundred degrees hot. By the time we reached the trailhead to Manzanita Ridge in the Trinity Alps Wilderness Area we were hesitating whether to hike through the unshaded high country in the overbearing heat. We decided to save it for another time and continued down the Trinity River Canyon along highway 299 where it was somewhat cooler. As luck would have it we stopped at the Trinity River Raft Company near the tiny settlement of Big Flat. And, they had a whitewater raft trip available for us if we wanted to go. We did and paid our $60 per person fee for a three-hour trip through the Class III rapids on the Trinity River. This was a fine alternative to hiking in the hundred-degree heat and better yet, along with our guide Kyle we had the fourteen-foot inflatable raft to ourselves; we were the only clients for the trip. I had whitewater rafted many time before, but it was Sonia’s first trip on a whitewater river and she loved it. We dropped through the rapids almost capsizing a few times but stayed afloat while getting soaked in the cool, clear water. It made the long drive worth it and satisfied, we dried off in the hot sun and made the long drive back through the beautiful Trinity River Canyon to our quiet, shady camp at Van Duzen park. By now Van Duzen park had become home to us and decided to relax in this comfortable place the next day to plan out the rest of our journey through California. We had reservations to stay in a state park in Napa Valley’s wine country four days from now, so should we stay at this peaceful park until then, or move on to Mendocino further south? It was a hard decision, but in the end we decided to move on and explore the southernmost reach of the redwoods at Mendocino. We left for Mendocino knowing it would be more crowded there since it’s only 120-miles away from San Francisco. And, we couldn’t get reservations at a park anywhere – they were all booked up. We’d have to wing it. We used maps and RV camping applications on the internet to plan out our “winging-it” route. The plan; drive along the coast to Mendocino stopping at parks along the way until we found a spot. If we couldn’t find anything we’d drive on to Santa Rosa where there were some primitive national forest camping areas near the site we had reserved a couple days later at Sugarloaf Ridge State Park outside of Santa Rosa in California’s wine country. We filled the trailer with fresh water, the truck with diesel fuel, filled all of our drinking water jugs, and dumped our waste tanks at the free RV dump station at a Shell gasoline station in Fortuna. Now we were prepared to camp anywhere. We said goodbye to our tranquil campsite at Van Duzen and the park ranger that we had gotten to know and drove south along highway 101. We were doing a loop through the Mendocino coast, turning off of highway 101 onto narrow, winding highway 20 to the coast, then south to the town of Mendocino, and back inland on equally narrow and winding highway 128. We arrived at Fort Bragg on the Mendocino coast slightly car sick from the twisting highway 20. Here the Pacific Ocean is much more pacific. The rocky coastline is punctuated by quiet bays and coves and the ocean much gentler than the wild Lost Coast to the north. Low, rolling, grass-covered hills rise along the coast calm instead of the rugged, wild mountains further north. The area was almost pastoral, civilized, and more populated. Highways 20 and 128 were pretty tight for our truck and trailer. There are four state parks near the coast at Fort Bragg and Mendocino, a collection of private RV parks and a couple of primitive campgrounds in nearby Jackson State Forest. Surely we could find a place to camp in one of those. But, we found that they were either all full, or our twenty eight foot long trailer too big to fit into the parks and the private RV parks were expensive and crowded places, very unappealing. Finally, a park ranger said we could find a spot at Westport-Union State Beach almost twenty miles north of Fort Bragg on the coast. But, when we arrived we found it a crowded, windswept bluff costing $45/night with no utilities or even water. We moved on. 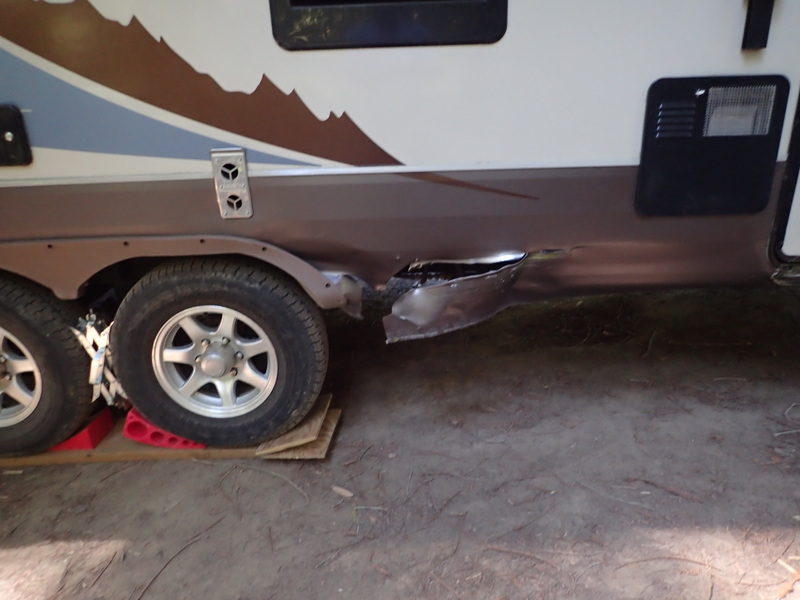 It late afternoon, we were tired, and then, while negotiating a tight turn in Van Damme State Park south of Mendocino I ran up against a concrete post on a narrow bridge and ripped a nasty gouge out of the bottom panel of the aluminum skin of our fifth wheel trailer. This was turning into a bad day! Good thing we have insurance, but it added to the stress of wandering around looking for a place to stay. We hastily duct-taped the torn aluminum sheathing together and drove on. We passed Mendocino and turned onto narrow highway 128 leading away from the coast towards Santa Rosa. We passed a few places where other RVers had set up their trailers in turnouts or parking lots forming impromptu camp sites, but we wanted something more secure. Besides, from our research we knew there were more parks along the way, so we kept going. Thirty miles away from Mendocino we turned into Hendy Woods State Park off of highway 128. Surely there would be a place here, but no. Full up. The ranger said there was a small county park just a mile and a half from there, Indian Creek, a Mendocino County Park. It was getting late, but we drove on. We saw the small sign for Indian Creek County Park as the ranger had described. Good thing he told us about this place, it would be easy to miss. Just turning our truck and trailer into the narrow entrance road would be a challenge; the turn off from the highway was too sharp for our truck/trailer combination. We pulled into a small turn out by the entrance and parked and then walked into the small park on foot to scout it out. It was a small, pretty place in a grove of old-growth redwoods with ten campsites and only two other people camping there. The self-serve kiosk said that it was $25/night to camp, no utilities and water only at community spigots– it would be a “dry” camp. Oddly, we had a good cellular signal, so we could access the internet through our cell phone’s hotspot. We had our generator in the cargo hold so power wasn’t a problem and plenty of water on board. But the road through the campground was very narrow and made a series of sharp turns through huge redwood trees. And, there were only one or two spots that we thought we could maneuver our truck and trailer into. Turning the trailer and truck around when we left would be a challenge too since the turn-around loop at the end of the narrow road was very tight. The whole thing was iffy. But we were tired, it was getting dark, and we were still stressed out from the damage to the trailer. We decided to go for it. There was a road intersection directly across from the entry road into the park, so I used it to turn the truck and trailer around so that we faced directly into the park entrance on the other side of the highway. That worked and once into the small park we carefully wound our way through the big redwood trees to a campsite that we could just barely fit into. By then it was getting dark, so we hastily paid our $25 camping fee at the self-serve kiosk, ate a salad for dinner, and went to bed exhausted. We would figure out how to get out of the park tomorrow. The next morning we found that we were in a beautiful little park set in a small grove of old-growth redwoods with a clear brook running through it. The few campers in the park left and we walked the campground to further investigate how we could get out when the time came. Bad news. The turn-around area at the end of the short park road was far to tight to turn our truck and trailer around in. Luckily for us a neighbor camper left in the morning vacating the only big campsite in the park, campsite #1. It was big enough for our truck and trailer. But, we’d have to back out the winding roadway to reach it. Oh well, we’d have to back out eventually anyway. With Sonia guiding me through the trees I backed up the winding road and managed to maneuver the trailer into the large camp site without further damaging it. We spent the day using the strong cellular signal to access the internet and plan our route, make minor repairs on the trailer, and to contact our RV dealership to arrange for repairs when we returned to Oregon in a month or so. After paying our $25 camping fee for the new campsite we considered driving the thirty miles back to visit Mendocino, but decided to relax in camp instead. We were still too tired to drive around, the park was too nice to leave, and besides, the next night we had reservations at Sugarloaf Ridge State Park so the immediate future was taken care of. We simply decided to take the day off. This little campground ended up being one of our favorite spots. We had entered the beginning of the Anderson Valley, a prime wine-grape growing area, and I walked up the road from the park entrance to find the Madrone Vineyard set tranquilly amidst the golden-brown hills of California’s wine country. When I returned to camp we relaxed in our lounge chairs under the redwood trees along tranquil, bubbling Indian Creek soothing our frazzled nerves. We had reached the end of Redwood Country and had entered California’s wine country. Now it’s on to the sunny foothills of the Napa Valley for a few days of wine tasting before turning northward to the Sierra Nevada mountains, passing Yosemite National Park and Mount Lassen, and then drifting into the high deserts of far eastern Oregon to explore one of the most remote and wild areas remaining in the conterminous United States. That will be in our next report.